The first difference between white gold and platinum is the most basic and is the foundation of all the other differences. White gold and platinum are different metals. White gold starts out as gold. Gold is yellow. Platinum is itself a white metal. White gold and platinum have their own properties that make them unique. How is white gold made? White gold is an alloy of gold and some white metals such as silver, nickel or palladium. The white color is achieved by a careful choice of the alloying metals, which bleach the deep yellow of pure gold. The amount of alloy mixed with gold is called its karat. The key to understanding gold karat is the karat value over 24. An example is a 14-karat gold wedding ring. It is 14/24, which equals 58.3% gold and 41.7% alloy. The white color is achieved by a careful choice of the alloying metals, which bleach the yellow of pure gold. How white gold and platinum start out is one of the key differences. White gold even in the best mixture has a hint of yellow. Platinum is a gray white and will keep its color true. One big problem for white gold is the poor mixtures. Some manufactures of white gold look light yellow and never achieve the white look. It does not sound like a big problem because if you don’t like the light yellow look, of a specific manufacture then don’t buy it. New white gold rings are usually coated with a hard protective finish of rhodium, a silver-white metal like platinum. The rhodium plating is used to make the white gold look more white. The Rhodium is very white and very hard, but it does wear away eventually. 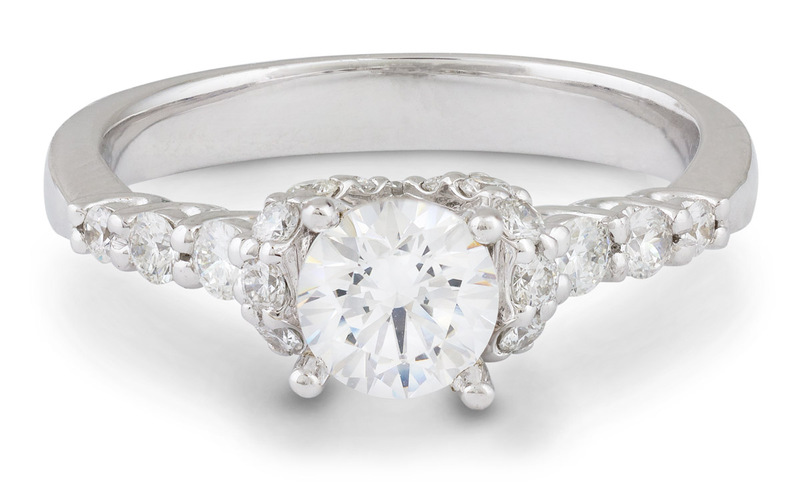 When the rhodium wears away the quality of the white gold is seen for the first time. Yes, you can recoat or plate the white gold with rhodium every time it looks yellowish, but is that what you want? 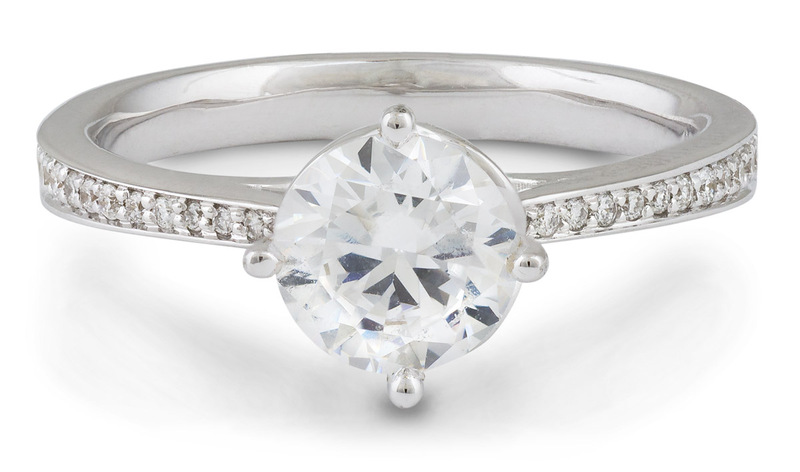 If you want a pure white ring, then platinum will keep its whiteness. If the light yellow look doesn’t bother you, or it looks better to you, then white gold is a great option. White gold is an alloy of gold and some white metals…the white color is achieved by a careful choice of the alloying metals, which bleach the deep yellow of pure gold. Alloying also effects the second issue. Both pure gold and pure platinum are soft metals. In fact both 24 karat gold and .999 platinum can be scratched and dented with a fingernail. Nether gold or platinum in their pure state will hold a shine for long. All white gold jewelry and most platinum jewelry are alloyed. The alloying is also a hardening process for both metals. The hardeners used in platinum is either 10% or 5% of the mix. 14 karat white gold has 42% and 18 karat has 25% alloy used to whiten and harden. The more alloy makes white gold a harder metal then alloyed platinum. The hardness issue is important when considering the brightness of the finish. The harder the metal, the more shine the finish will show and hold. White gold is harder then platinum therefore it holds its shine longer. Platinum does not wear away. Like all precious metals, platinum scratches. However, the scratch on a platinum piece is merely a displacement of the metal and none of its volume is lost. Platinum achieves a satin finish and maintains it a lifetime. Another minor difference is the weight. Platinum is heavier (specific gravity: 21.4) than gold (specific gravity: 19.3). When you alloy white gold the difference is even greater. The difference on a small ring is small but on a large piece, it is very noticeable. Both metals are price per gram, so this adds to the higher price of platinum. Price is a big difference between platinum and white gold. Platinum cost 2.5 to 5 times more than white gold. Why? Platinum has a higher noble metal percentage in jewelry. Platinum is harder to work with than white gold. The higher melting temperature makes it more difficult to cast. The platinum solders also flow at higher temperatures. These and other reason make platinum more expensive to work with than white gold. So, the labor cost of platinum jewelry is more also. Want to see some real-life jewelry in these different metals? You can always come by our shop to touch and see the differences in person. Or, you can checkout some platinum and white gold products available online right here. My ring is stamped simply PLAT and has a jeweler’s mark next to it. Is this genuine platinum stamp? The ring weigh 10 grams. Hi Donna, thanks for commenting. Yes, you most likely have a Platinum ring. That said, without seeing the piece in person, we are just trusting the stamp. I would be happy to confirm the metal for you in person. Swing by the store anytime we are open. I inherited a ring from my grandmother that is white gold (I think). It is marked 14k P What does the P stand for? Hi Lauren, good question. The “P” most likely stands for plum gold. That means that the piece contains exactly 58.5% pure gold. You can read more about plum gold in our article on gold purity. Hello my name is Michael and I was just wondering if you could tell me how much will my 120 gram Raw Gold platinum Nugget be worth? Hi Michael, good question. The price will be determined by how much of each precious metal you have as well as the purity of each metal. If there is any host rock, that weight will be subtracted. Assuming there is very little host rock you could have anywhere from $800-$2,500. If there is a lot of host rock, then you could have as little as $120. As you can see, natural nuggets vary significantly in purity, so it’s difficult to estimate value without actually melting the piece down. Is there such thing as 32ct gold? What are the carats for white gold? Hi Patty, thanks for commenting. There is no such thing as 32ct gold. Gold purity is measured in karats (or carats in some countries) and it is a scale that goes up to 24k (24k being 100% pure gold with no alloys). Generally the highest purity white gold is 18k (about 75% pure gold with the rest being alloys), although we have seen 19k white gold advertised from some manufacturers. Since gold is naturally a yellow metal, the more pure you get (i.e. the higher karat number) the harder it becomes to change the color of the finished alloy. Beyond 75% pure gold, it doesn’t really matter what other metals you add to the alloy, the final product will still be some shade of yellow. You can read more about gold purity on our article. What color when white gold burned? Hi Nich, good question. When you melt white gold, like most precious metal, it can oxidize if you don’t take measures to prevent it (e.g. using boric acid). This oxidization gives the metal a black color, but it doesn’t actually change the color of the metal. The oxidization can be polished off returning the metal to its natural white color. Hopefully that answers your question, but feel free to reply if you have any additional questions. Hi there, just came across your page and wondered if you could tell me what the #70832 would stand for on my ring. There are other numbers but I need a stronger magnifying glass to really see them which I plan on getting. If you have any idea I certainly would appreciate the help. Thanks so much. Oh, this was my mother’s ring which I inherited and I believe that it was actually made for her because the diamond that is in it supposedly was in her engagement ring. Hi Ann, thanks for contacting us. That number doesn’t have an special significance that we are aware of. It is most likely a style number or a serial number applied by the manufacturer who made the ring. The other, smaller stamps may indicate the type of metal that the ring is made out of (10k, 14k, Platinum, etc.). If you are able to bring the ring in to our shop we can take a look at it and let you know for sure. Hello, my grandma gave me a ring which says 950 FB 18k on the inside. What does that indicate please? Thank you very much. God Bless. Hi Lashawn, thanks for commenting. “950 FB 18k” most likely means that some part of the ring is platinum and some of it is 18 karat gold. If any part is yellow, then that’s the gold part. If it’s all white metal, then the whiter, more dull or scratched up parts are probably the platinum. Hi Alice, thanks for commenting. The quick answer is platinum is heavier. But, if you want the longer answer then read on. Platinum is denser and therefore its specific gravity is higher. Pure platinum has a SG (specific gravity) of 21.4 where pure 24k gold has a SG of 19.36, and most gold we use in jewelry is 14k which has a SG of 13.4. Which is why a platinum ring feels much heavier than the same ring in 14k white gold. I commend you for this blog post. Although I know most of the details previously already, I still learn a few things from it. The writing is concise and easy to follow. Your replies to various reader’s questions are thoughtful and patient. Hi Tiddle, thanks for the kind words. That’s good information about the stamps inside of jewelry. We actually have a more in-depth article on that subject which you can checkout here: Gold Purity and The Differences Between White and Yellow Gold. Hi Nina, thanks for reaching out to us. Having a Nickle allergy is quite common, and you have several options. We have a full article on jewelry allergies that you can read if you’re interested. In a nutshell your main options are: rhodium plating, anti-allergy coatings (nail polish), non-nickle white gold alloys (like our star white gold), and platinum. Hopefully that helps, and feel free to contact us if you would like to learn more. How could I tell if a jeweller replaced the shank of my wife’s engagement ring with white gold instead of platinum? I am definitely coming to you for our next piece. Hi Chris, thanks for contact us. It can be quite difficult to differentiate white gold and platinum without the proper equipment and experience. We have gold testing tools that give us a good indication of what a specific part of a ring is made out of. In addition, there’s no replacement for the judgement of a skilled jeweler. If someone has worked with platinum and white gold extensively, they can generally tell the difference by doing a light file on the piece. If you are close by, we would be happy to test your ring for you. Just bring it by the shop. Hey there. I was wondering, how do you tell the difference between gold and silver? Hi Jenny, that’s a good question. Thanks for asking. We should do a full article on the subject to really explain it well. But, for now, we can summarize and say that Gold and Silver and completely different metals. Most silver you see in jewelry is called Sterling Silver which is at least 92.5% pure silver with the rest being a different metal. Silver, is a soft metal, and is much softer than 14k white gold. This causes is to wear sooner. Another difference is that Silver with tarnish over time which may or may not be desirable depending on the person. Like Platinum, Silver is naturally white whereas Gold needs to be alloyed with other metals (usually Nickle) to make it white. Hopefully that helps, and please ask if you have any additional questions. I would also like to know some more about white gold and platinum rings. What I would want to know is about how these metals are taken care of. How often is one supposed to clean or care for a ring? I would also want to know if these metals have a way of fading out. Hi Akweley, those are some more good questions. Regarding care and cleaning, the general rule of thumb is to have your daily-wear rings cleaned and checked by a jeweler every 6 months. There are also at home jewelry cleaners that you can use to keep your jewelry looking great in between checkups. Definitely checkout our article on care and cleaning for jewelry to learn more. Neither white gold nor platinum will “fade” over time, but depending on the alloy, you may notice white gold turning more yellow-ish over time. This is because most white gold is plated with a metal called Rhodium. Some white gold alloys are more yellow than others, but you can’t really see that when the ring is plated. Over time, as the plating wears off, you will begin to see the color of the white gold underneath. When you bring your ring in for its regular checkup, your jeweler will replate the white gold to make it look bright white again. Platinum does not have this issue as it is naturally white and does not require plating. 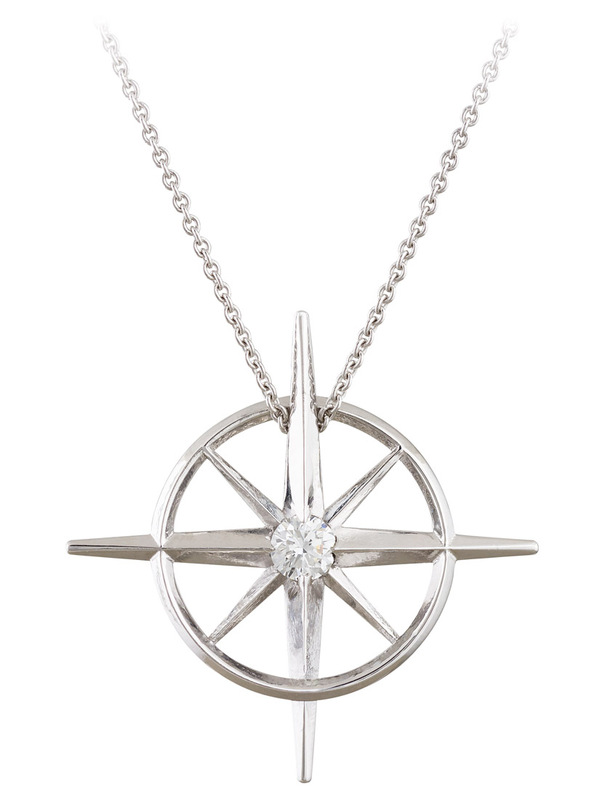 If you’re interested, you can learn more about white gold alloys from our article on our Star White Gold. Hopefully that helps, and feel free to ask if you have any more questions. Would you recommend I purchase a platinum ring or a white gold ring? I want to know because I love quality and durable stuff. And which jeweler would you recommend I buy from? I live in Ghana. I would also want to find out whether one should consider the weather as well when buying a wedding ring. Hi Akweley, those are some good questions. Thanks for asking. If you love quality and durability, I would say Platinum would be the best choice for you. When you wear a Platinum ring, you feel the extra weight and you know you are wearing a quality piece of jewelry. Platinum is also generally more durable than white gold over time. Regarding the weather, I wouldn’t consider it very much when choosing a metal for your ring. Platinum and white gold both hold up very well under almost any whether conditions. You might factor in the weather when deciding on a ring design, however. If you feel the ring will be exposed to a harsh environment, you may opt for a simpler, more sturdy design (something like this) as opposed to something more intricate and delicate (along these lines). The only other thing to consider with the weather and metals is allergic reactions. If you are allergic to the Nickle in some white gold alloys, sometimes adverse weather conditions can accentuate this, but that is very rare. As for which jeweler to buy from, unfortunately, I don’t have anyone I know to refer you to in Ghana at the moment. However, I can always recommend us. 🙂 If you see anything you like on our online shop, we can ship it to you. Or, you can send us an email (service@mygemologist.com) and we can take a look through our inventory that isn’t available online. Thanks again, and we wish you the best with buying your ring. Thank you so much for the reply to my question. What process (molding, machining) is adopted for manufacturing the jewelery of platinum iridium alloy? A ring made from a rod needs special machines or can it be made at home by using simple tools. That’s a great question. Jewelry is manufactured in a variety of ways. The most common technique is called lost-wax casting, and it involves carving a wax, filling the area around it with a material called investment, burning out the wax in an oven, and then filling the void left by the wax with liquid metal (platinum-iridium in this case). Casting in platinum is very challenging given the high melting temperature that platinum has. To produce a quality casting, an expensive, oxygen-free vacuum casting apparatus is usually required. That said, there are other ways to produce jewelry. Simple designs can be fabricated directly in the metal using common tools. Platinum is a very soft metal which makes it easier to work with than 14k or 18k gold alloys. If you want to fabricate in platinum, you will want a standard array of jeweler’s hand tools and a Foredom hand piece will probably come in very handy as well. Jewelry manufacturing is a complicated subject, and there are many tools and techniques to learn. There’s far too much for me to explain here. If you are interested in learning the trade, I would suggest looking into a jewelry trade school (the Revere Academy in San Francisco, CA is a well known local institution). Hopefully that helps. How is platinum iridium jewellery manufactured? Hello, that’s a good question. Platinum is usually alloyed with another metal in jewelry. Iridium is the most common alloy, but sometimes ruthenium or cobalt are used. Standard jewelry alloys are 950 Platinum and 900 Platinum. This means that the metal is made out of 95% platinum and 5% iridium (or other alloy) or 90% platinum and 10% alloy respectively. Hopefully that helps answer your question. Thanks for making this so easy to read and understand. BTW: In your last paragraph, it should be “than” rather than “then”. Hi Stephanie, I’m glad you liked the article, and thanks for catching the typo. We made the correction. Do you have an idea of Platinum that used from the engine of the ship? There’s a mark or number PT 70. Thank you. Hi Cleo, it sounds like you have an interesting piece there. We generally specialize in platinum that is used in jewelry (most commonly 900 or 950 platinum with iridium or ruthenium as an alloy metal). However, we might be able to help you with your engine piece. We’ll send you an email shortly to get some more details. Thanks for sharing. My question is that my ring is 57 years old and it is yellowed and I do not like it like that; is it possible to recoat or not????? Hi Sandy, good question. 57 years is a long time for a ring. It might be time for a checkup. 🙂 To answer your question, yes, we should be able to rhodium plate your ring to make it look nice and white again. Just remember that unless the ring is made out of Platinum or an alloy of white gold that doesn’t turn yellow (e.g. our Star White Gold), it will need regular plating to continue looking white.